I was at Vasai by 7.15am. Early enough, you’d think but I was still late. A whole week, to be precise. That’s how long this celebrated individual had been in the news, already. She had been granted a range of titles – which I’ll get to later – but the solitary female Red-breasted Merganser (Mergus serrator) that had somehow made it to the Rajavali wetlands in Vasai, was all birders could talk about. I met Adesh Shivkar, a veteran birder, at Naigon railway station that morning, along with Joel Cerejo and Nivedita Kothare to go see this rare species. The Red-breasted Merganser belongs to the subfamily of Sawbills, a specialised group of fish-eating ducks with bills that have thin, serrated edges that help them grip their prey (hence the species name, ‘serrator’). Recorded as one of the fastest ducks in flight (it can achieve speeds up to 100mph), it is also among the most widespread of the group. The species breeds in much of North America, Europe and Northern Asia, usually spending its time in freshwater lakes and ponds. During winter, it migrates south to the coastal waters of Mexico, the UK, the Mediterranean, China, Japan, and the southern coasts of Pakistan. In India, there exist only a couple of records, from two locations of West Bengal in 1889 and 1961. In fact, one of these might pertain to an individual collected from the market. This sighting, therefore, represents the first verified record of the species in India, establishing itself as a ‘mega-lifer’ for birders who keep a checklist for the species they see in the wild (a lifer is a term reserved for the first sighting). This is also the reason the bird is considered a ‘vagrant’, a term used when a particular species is observed outside both its breeding and migration ranges. Dr Rajaneesh Ghadi and Dr Mangesh Prabhulkar, amateur birders from Vasai and part of NEST (Nature Environment Society of Thane) first came across this bird - unlike any they had seen - and photographed it on December 21, 2016. They uploaded it on social media - which has started to play a valuable role in uncovering rare finds - hoping to ascertain the species. Discussions between birders revealed that Dr Vinod Verma, a birder had also photographed this bird a week ago. 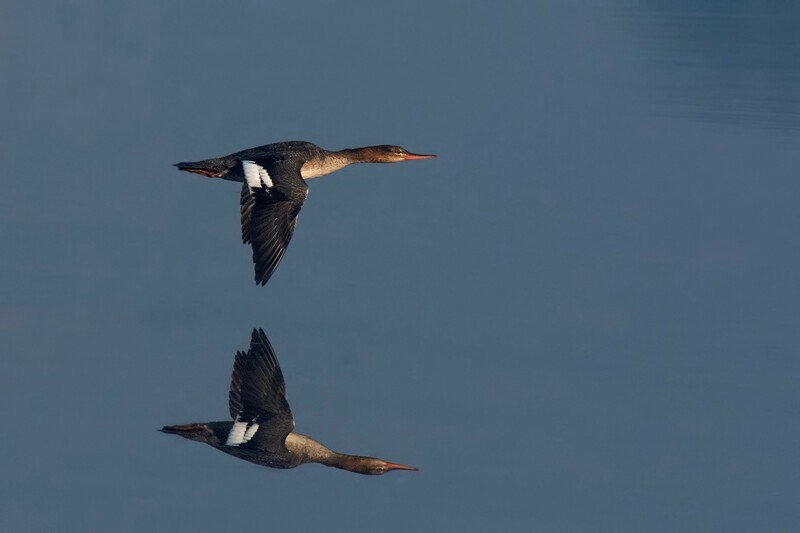 A young birder, Advait Marathe was among the first to hint that this could be a Red-breasted Merganser, a fact later reiterated by Sachin Main, another senior NEST member and Shashank Dalvi, one of India’s finest birders. 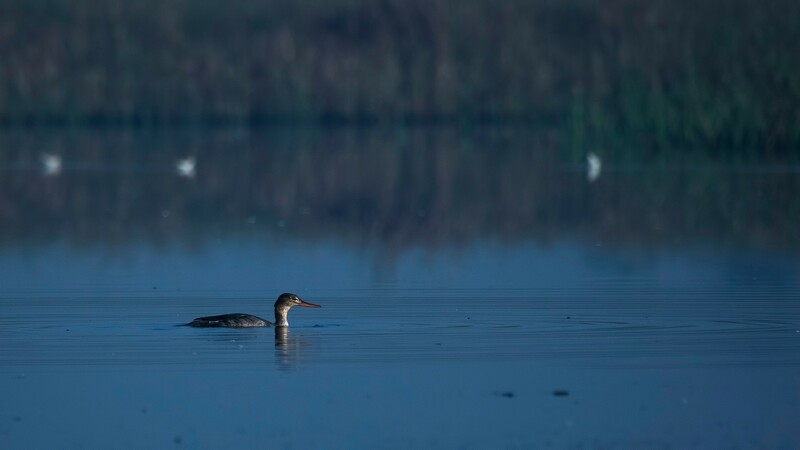 Further research compared it with its closest cousin, the Common Merganser or Goosander, which inhabits the high altitudes of Kashmir throughout the year, as well as parts of Uttar Pradesh, Assam, Arunachal Pradesh and a few other northern states as part of its wintering range. The slimmer build and bill, the lack of stark contrast between the white throat and brown neck, as well as a prominent dark line across the speculum on the wing of the bird helped establish this as a female Red-breasted Merganser. There has been no sighting of a male here; a rather distinctive bird with a prominent white collar and a ginger-striped breast. We were lucky to see her right away that morning at her usual haunt. Her head was dunked in the shallow pond, body bobbing on the water, aggressively feeding on the fish and small invertebrates. According to Adesh, who has spent many years observing vagrants, these individuals are likely to have lost their way (ascribing factors such as climate change to such cases would require steady observations and knowledge of consistent migratory trends of individuals over time). Hence, they feed vigorously before moving on to their regular range. Adesh has also noticed behavioural extremes in vagrants such as these - some are very shy and retiring, others quite friendly. Luckily for us, this merganser belonged to the latter category; she paused only for the briefest moment to look around, continuing to nonchalantly swim, giving her adoring audience a good view. Except for murmured conversations and shutter clicks, all was quiet. This may, however, be the last time we see this bird here; it is a vagrant, and here in a habitat that is constantly changing. Much of the area is privately owned and already earmarked for construction. In fact, the freshwater bodies in which the merganser has been spotted are a recent development - depressions made by the construction of roads, which have now filled with rainwater. In addition to private construction, the latest draft development plan of the Mumbai Metropolitan Regional Development Authority (MMRDA) outlines major development plans of industrial corridors, residential projects and a range of infrastructural projects such as the Metro Rail in the Vasai-Virar region. 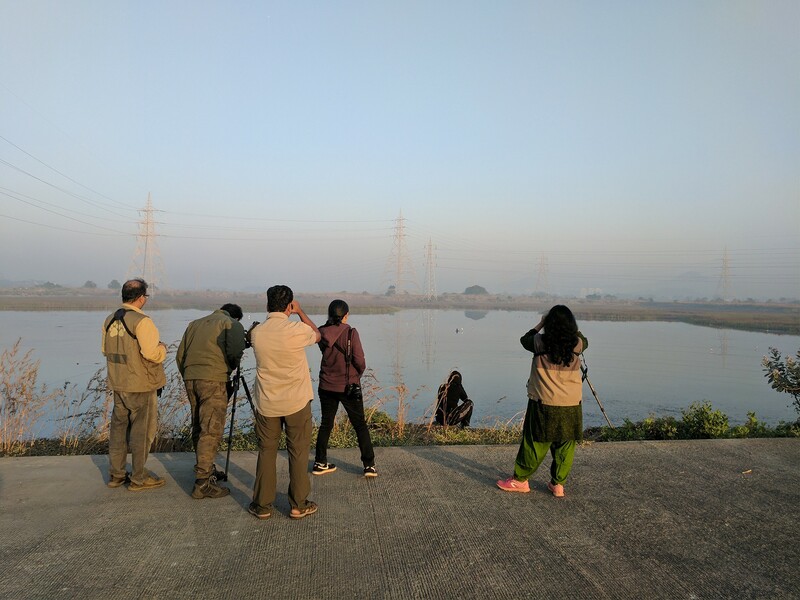 Platforms such as eBird and a very active network of birdwatchers, including some who have started specialised apps like ‘Vasai Birds’, have been vital in documenting bird diversity here, and with records of over 250 species in recent years in the Vasai/Virar region, there can be no question of the area’s avian diversity. Birders rushed to photograph this rare bird in Vasai. Local residents, as well as, citizen bodies such as the Nirbhay Jan Manch will be including their comments/ objections on the draft, for which the MMRDA has allowed time till January 15, 2017. There is certainly scope for infrastructural growth in the region but it will be interesting to see how this is balanced with preserving the wealth of biodiversity, in particular, the avifauna of the region. PS: At the time of writing this piece, incredibly, another Red-breasted Merganser has been recorded at the Gajoldoba wetlands in West Bengal.